Standard domestic waste separation is now reasonably well understood by the community but remains poorly practiced in healthcare, including in dialysis units. Further, structured, innovative waste management remains a ‘largely undiscovered continent’. If properly managed, waste management has the potential to leave a far smaller environmental impact than is currently the case. There are three main waste disposal streams in healthcare: recycling, general waste, and clinical (infectious) waste. Appropriate segregation of clinical waste minimises the need for incineration and/or chemical disinfection prior to waste disposal, while optimal recycling reduces the burden on scarce community landfill sites. All entail significant financial and environmental cost. Each dialysis treatment generates a mean 2.5 kg of infectious waste/patient, while one European study (Piccoli et al) recorded as much as 8 kg/treatment. The amount generated depends on machine and consumable choice. Currently, much of this is ‘yellow bagged’ as clinical waste, ignoring opportunities for recycling and cost savings. All renal units have the ability to improve their management of waste. Important – HD and PD generate a lot of waste! Achievable – it is under the control of those working ‘on the floor’ with improvements within staff capabilities. Visible – improvements can lead to a significant sense of achievement, boost staff morale, and feed a willingness to undertake further green projects. Click here for a step-by-step guide (see boxed items) to conducting a waste management project in your facility. PVC is the most commonly used polymer in medical products and forms a large part of hospital general waste sent to landfill at high cost. its’ manufacture and incineration releases dioxins, that can enter the human food chain and cause a wide spectrum of adverse effects in humans. But, programs do now exist for recycling of PVC in hospitals, allowing the conversion of PVC into useful products: hosing for fire extinguishers, gardens and industry; safety mats for children and workplaces. Click this reference to see how to implement a PVC recycling program in your facility. Even with the most effective waste recycling programs, a large proportion of hospital waste … and most dialysis waste (except packaging) … is regarded as ‘infectious waste’. Clinical infectious waste must be (1) incinerated prior to disposal, with all the potential consequences of air pollution, or (2) chemically sterilised, then buried as ‘toxic’ landfill, risking water table pollution. The cost of disposal of clinical infectious waste = 5 x the cost of general waste disposal. Waste-management systems now exist that render all waste non-infectious using point-of-generation steam sterilisation by autoclave. This effectively kills any/all potential bacterial and viral contamination. These sterilising systems are in current use – but not in dialysis units. Examples include the SteriPlus™ systems, a family of systems that shred and autoclave medical waste into a sterile ‘non-infectious’ confetti-like chaff. Current research is underway in Geelong, Victoria to determine if sterilised and shredded dialysis plastic waste could be incorporated/sequestered into concrete. This work, published to date in abstract form, has met with intense local and international interest and coverage. Other shred and sterilise systems include: the Sterishred series, the Celitron, and the Meteka. Chemical sterilisers are also available. These generally use bleaches. They are cheaper but have the disadvantage of a less certain ‘kill’ (esp. fungal spores), while the chemical effluent has environmental implications of itself. While these systems are not cheap, the potential savings that may accrue over time can offset the set-up costs. A dialysis treatment generates ~2.5 kg plastic waste/treatment. A 10-chair unit, operating 2 sessions/day, 6 days/week, would generate 15,600 kg plastic waste annually. Currently, this would be disposed of as clinical infectious waste, at an estimated cost of ~ 0.78c/kg. The total annual cost of waste disposal for this 10 chair dialysis unit is thus $12,168. If dialysis waste could be rendered sterile, the annual cost of waste disposal would drop to $3120. If a suitable on-use for the sterilised all-in plastic product were found, the processed plastic end product could either be given away or sold, the latter generating an income stream to further reduce processing costs. Waste management is wide open for innovative improvements in both practice and outcome. The following data formed part of abstracts presented to Safer Victoria (2017), and the Annual Dialysis Conference (Florida USA 2018) … see page A6. HD generates ~2.5 kg/patient/treatment . HD patients generally access 3 treatments/week. Thus each HD patient generates ~390 kg/year. PD generates ~1.3 kg/patient/day . But, as PD is a daily treatment, each patient generates ~475 kg/year. The Australian and New Zealand Dialysis and Transplant Registry (ANZDATA) 2017 Report records that 12,706 Australians were on dialysis at the end of 2016. ~80% of these were on HD, while ~20% were on PD. This generated ~5,100 tonnes of single use, discarded, high quality medical plastic in that year. As dialysis numbers rise, this will likely be an annual ~6,000 tonnes in 2018. There are an estimated 2.5 – 3.0 million people on dialysis, world-wide … no-one really knows. This creates ~975,000 tonnes of infectious landfill/year … nearly 1 million tonnes. It can be hard to visualise 1,000,000 tonnes. 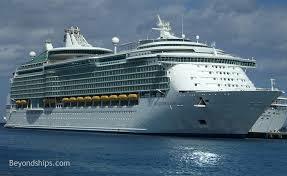 So … 1,000,000 tonnes looks like FOUR of these (minus the lifeboats)! Researchers in the School of Engineering at Deakin University, Waurn Ponds are working with teams from Barwon Health and the Royal Melbourne Hospital to incorporate shredded, sterilised ‘all-in’ dialysis plastic to concrete. Early test results suggest an improved concrete product – particularly regarding its water-resistant properties. It is tempting to dream the closure of an eco-loop … the integration of RO reject water (for autoclave steam generation), and solar-assisted power (for autoclave operation), to reprocess dialysis (and other) medical plastic waste … and fully test the eco-waste management hypothesis. While this is unlikely to be financially viable for any individual, dialysis-specific service – it may prove cost effective if centralised systems were set up to process large volumes of hospital-wide waste. This potential is beyond the scope of this document to explore. While efforts to appropriately segregate waste and recycle in healthcare are important, we must simultaneously reduce the amount of waste generated. This can be quite easy to do and lead to cost savings and patient benefit. The Environmental Sustainability Special Interest Group (ESSIG) – a working group of the Victorian Renal Clinical Network – examined various methods of draining and disposing of automated PD effluent. This showed that draining PD effluent into a reusable drum rather than to a drain bag or drain line reduced costs and waste, and was more convenient for patients. ESSIG also surveyed the environmental practices of all renal services in Victoria, and received managing unit responses that represented 628/660 (95%) of all dialysis chairs in the state. 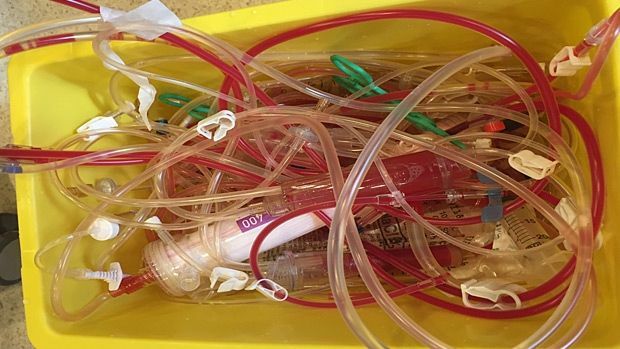 This showed ‘much green intent’, but ‘little green practice’. .
As green practice spreads – as this website hopes it will – new ways to reduce waste in dialysis may emerge. If/as they do, share them through this website (see the blog function), and consider submitting abstracts to national and international scientific meetings (see … https://www.nephrology.edu.au/awardsfellowshipsandgrants/anzsnawards.asp).